High power, passive sub-bass cabinet with one 18” low frequency neodymium transducer with nomex suspension & surround in direct radiation configuration. 134 dB SPL (1600W Program) Specifications Components LF 1 x 18" transducer (100m voice coil) Frequency range 30 - 230 Hz Frequency Response 35 - 200 Hz Sensitivity (1w@1m) 105 dB Max. 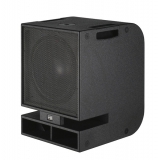 SPL 134 dB RMS power 800 W Program Power 1600 W Coverage angle 360º single unit Impedance 8 Ohms Input Connectors 2 x Neutrik Speakon NL4MP Construction 18mm Premium Birch plywood Finish High resistant water-based black paint. Black steel grill with acoustical fabric protection Dimensions (H x W x D) 733 x 570 x 630 mm Weight 44 kg http://www.polyphonic.be/produits.php?lang=uk&page=1⊥age=80&table=mat_vmb&cat1=Audio Původní cena 27990,- !! sleva 40% Prodej pouze v páru! Doprava na dotaz. Přepínač audiovideosignálu se třemi vstupy a jedním výstupem RCA (CINCH). Umožňuje připojit až 3 různá AV zařízení pomocí Cinch (RCA) a jednoduše mezi nimi přepínat signál do jednoho TV (monitoru).